Did the whole world hear my family squeal at the top of their lungs with delight when we got news of one of our latest reviews? 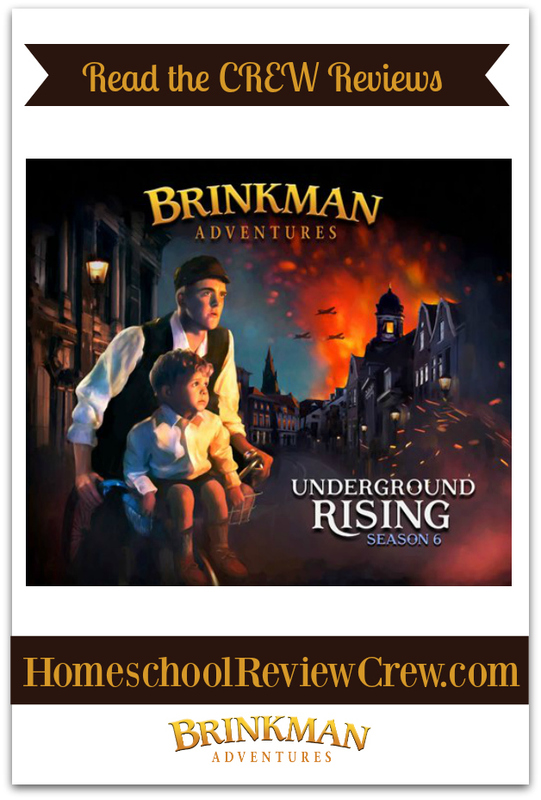 That’s right our family was privileged and blessed to have our request to review the digital version of Season 6: Underground Rising from Brinkman Adventures. If you haven’t heard of the Brinkman Adventures before then you’ll want to pay attention because these audio adventures could breathe a lot of life into your family. Season 6: Underground Rising came to us as mp3 downloads that I added to my phone via iTunes. You can also purchase audio CDs. You will get over 2 hours of thrilling audio that will build your faith and leave your family begging for more stories. This season is action packed and the stories will keep your family on the edge of your seat. In this season we learn about people like eng and Lynn Van Kesteren, the Brinkman Family, Brian and Kelly Wonder, and Dave and Karen Eubank. Through these stories, your family will travel the world while learning about some amazing things God has done and the work missionaries are accomplishing in his name. All of the stories are based on true stories though a little bit of fiction is tossed in as well. We listened mostly in our truck on our way to and from our usual activities. I was not surprised to find ourselves sitting in the driveway after we arrived home as we just could not stop listening at times. My boys were even hunting down excuses to go out just so we could listen some more! These stories are just so captivating.They are also thrilling and some themes might be a little scary for younger children. They were not even for my youngest at 4 years. I love the conversations my family has after listening. These stories really challenge our faith and trust in God. He really can do the seemingly impossible. It puts our own lives into perspective and hear about the great lengths, heartache, deprivation, and even the danger faced by Christians around the world. The stories are faith challenging, moving and inspiring. Your whole family will be impacted, yes even Mom and Dad. Maybe especially Mom and Dad. I fail to find the words to adequately describe just what a treasure these stories are. The voice acting (done mostly by the family that compiles these stories) is fantastic. The music and sound effects are wonderful. In fact, the bump music that leads into each new adventure has become something of a theme song for our family. We quite literally bop along in our seats while cruising down the highway to our own adventures. I know that perhaps in 10 years from now when I come across these stories and that music again I will be transported back in my mind to these days and this time with my family. It may sound sappy but it is very meaningful to me. The first two stories entitled the Dutch Underground left me shaking. I know that sounds dramatic but it is the truth. This is the story of Nazi invasions during WWII. It is the story of a couple and their friends who felt called by God to resist the Nazis and help the Jews and others who were in danger. They risked their freedom and safety to do so. Not all from their party survived. Could I be like these heros? Would I follow God’s will and risk everything to help others? Would I resist or would I stay safe, try to? With these stories, my children began to understand the freedoms that we have here in this country at this time that others around the world don’t have. They began to understand how a government can (or an invading force) can come in and destroy people. We lived with this story for many days, replaying parts, and revisiting the conversations. You need to go to https://brinkmanadventures.com/real-stories/real-stories-season-6 and learn more about the real people behind these stories. There are photos of the real people in these stories and so many more details that bring it all to life. The second story, Twice Born Fly, was delightful. This one was different. It wasn’t the true story of an actual missionary but the story of a dream. A dream that demonstrates God’s mercy and love and the gospel in a compelling way. If you’re looking for a path to really help a child, or an adult for that matter, understand Jesus and His saving grace through salvation then you will not want to miss this. I’m going to stop describing these stories here. Please trust me when I say that listening to these stories ranks up there in the top 100 best things my children and I have ever done together. I urge you to give them a try. For the time being, you can even save a bit of cash when you purchase. You can learn about the Brinkman Adventures on their website and Facebook page. You can also check out what other bloggers on the Homeschool Review Crew loved about these stories by clicking on the banner below.